Mark Thomas Gibson at UArts's Rosenwald-Wolf Gallery, “The Dangerous One"
It is not often a gallery’s walls are painted a specific color to flatter the art. It’s certainly not common to paint a gallery’s white walls black. But that’s what UArts’ Rosenwald-Wolf Gallery has done for Mark Thomas Gibson, a recent transplant to Philadelphia from New Haven, Conn., for the exhibition “The Dangerous One." 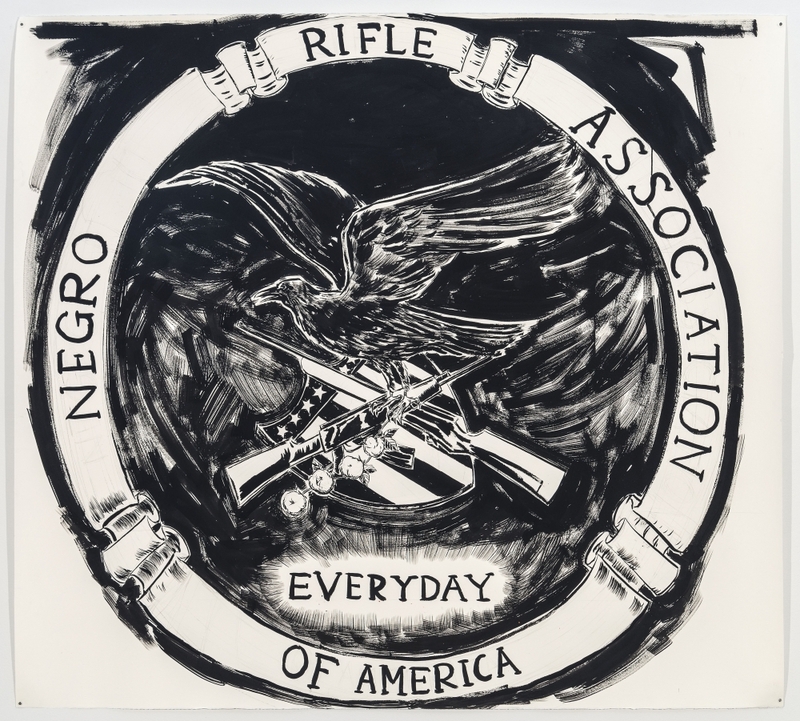 And it’s precisely what Gibson’s sprawling, frenetic, black ink drawings called for. His drawings have such visual intensity that the images don’t just “pop" against their unusual backdrop. They explode. Gibson’s dystopian reenactments of American history seem to have been created in a feverish bout of energy. A deranged George Washington crosses the Delaware surrounded by a drunken, vomiting crew of lowlifes. Hungry Pilgrims boil and devour Native Americans. A Trump rally of smiling, wide-eyed supporters has a mysterious black hole at the front of the auditorium. Several contemporary satirical artists are freely quoted in Gibson’s works, most obviously Raymond Pettibon, Robert Colescott, and Kara Walker. It struck me later that he’s also referencing William Hogarth’s A Rake’s Progress and Francisco Goya’s The Disasters of War. Gibson’s pastiches are thoroughly his own, though, powered by dark humor and high-octane drawing. Through March 8 at Rosenwald-Wolf Gallery, University of the Arts, 333 S. Broad St., 10 a.m. to 5 p.m. Mondays through Fridays, noon to 5 p.m. Saturdays. 215-717-6480 or uarts.edu/about/rosenwald-wolf-gallery.